Every bike needs a bell! And what better way to show off your own personal style than with the Electra Bottlecap Bicycle Bell? It comes with a mounting clamp that fits most mountain and hybrid bicycle handlebars, and makes a the traditional "ring-a-ling" bike bell sound to alert folks that you're passing. Ride your bike to your favorite grocery store. Purchase your favorite bottled beverage. Carefully carry said beverage as you ride home. Carefully remove the cap from said beverage using your favorite beverage cap removal tool. You don't want to remove it in one fell swoop like you usually do. You want to pry the sides of the cap a little at a time without denting the top. Go around the sides little by little until it's loose enough to pry off with your fingers. Joyfully consume the beverage from the bottle. Place bottle in recycling bin. 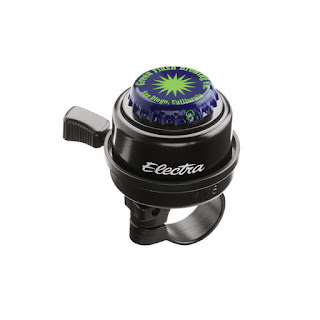 Press bottle cap onto the top of the Electra Bottlecap Bicycle Bell. The Electra Bottlecap Bicycle Bell is IN STOCK in all three Century Cycles stores! And, with our Winter Sale, take 10% OFF the regular price of $9.99 -- that makes it $8.99 plus sales tax! Bring your bike and we'll install it for no extra charge! Bonus points if you bring your favorite bottled beverage to share with us!